Welcome back! 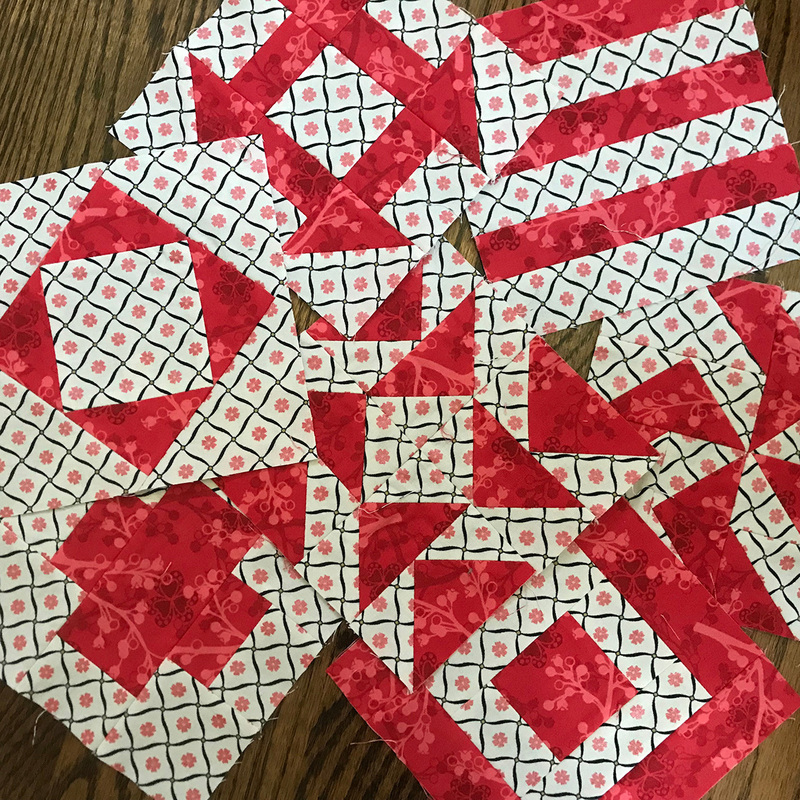 I’m BERNINA Expert and Amanda Murphy and I hope you all are excited for Month 2 of the BERNINA 125th Anniversary Quilt Quilt-Along! I hope you have been excited to gather the materials and get started. The BERNINA 125th Anniversary Quilt. 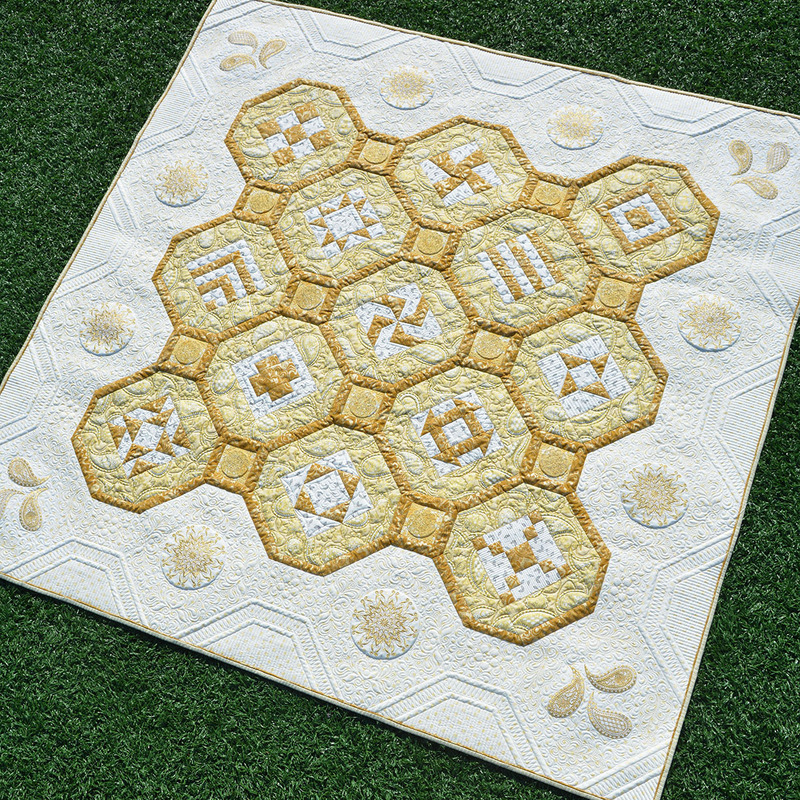 Kits for this quilt are available from your local BERNINA store and are being bundled with 125th Anniversary Edition Machines. This month, we’ll keep things simple and piece the remaining half of the feature blocks. You can find the instructions for those blocks here. Blocks, J, L, and M are pretty straight forward, with simple straight seams. Block H is typically referred to as an Economy Block. I made a special video for you for this one. For those of you who are incorporating embroidery, how are your Cornerstones coming? If you missed the post where I show you how I embroidered these with gold thread and also gave you other options, you can find it here. We’ll be piecing the Cornerstone blocks in November, so try to finish those embroideries before the end of this month. We will also be working on the border embroideries in November. Right around the corner…. border embroideries! I have a video for you that I’ll be showing you in November to make this easy. 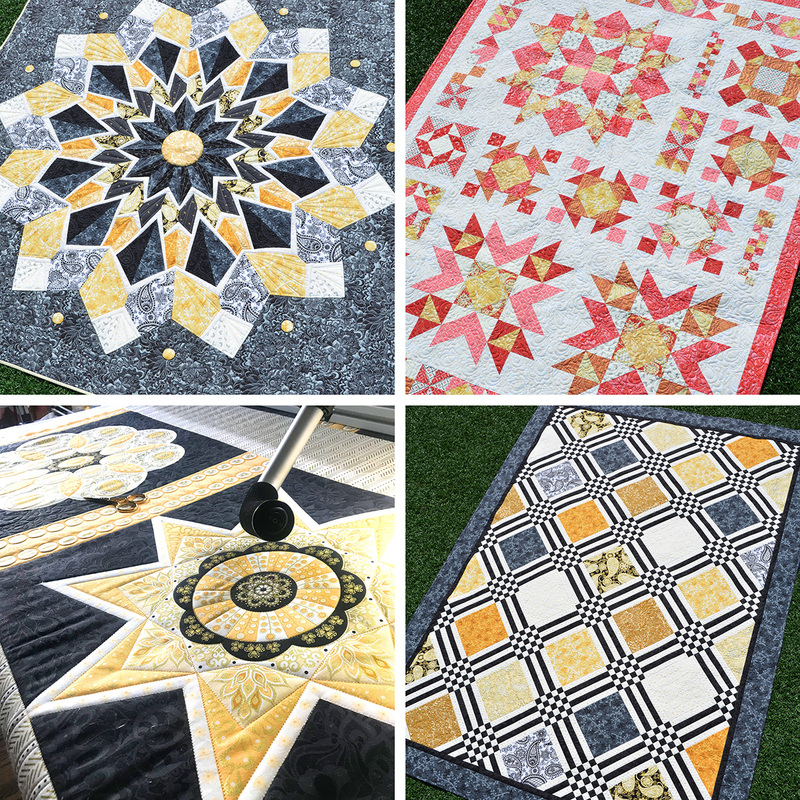 For those of you who have written me regarding the availability of kits for the other quilts in the Jubilee line, please know that, due to popular demand, Benartex is making these kits available to shops. 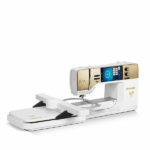 (Benartex does not ship direct to consumer so you must ask your local shop to order.) These should be shipping in October for dealers who ordered at BU and December for other orders. Shops can contact their Benartex rep for more information. Clockwise from top left: Diamond Jubilee, Ruby Jubilee, Platinum Jubilee, Jubilee Ruler Panel with Guide. Diamond Jubiilee, Ruby Jubilee, and Platinum Jubilee will be offered as kits by Benartex. The Jubilee Ruler is a practice panel that coordinates with the rulers I used to quilt the 125th Anniversary Quilt. Last but not least, please remember to post your progress in WeAllSew’s Community! You can find the Community Tab at the top of this page. Remember that you have to post your progress six times in order to win one of the amazing prizes so now is the perfect time to start! 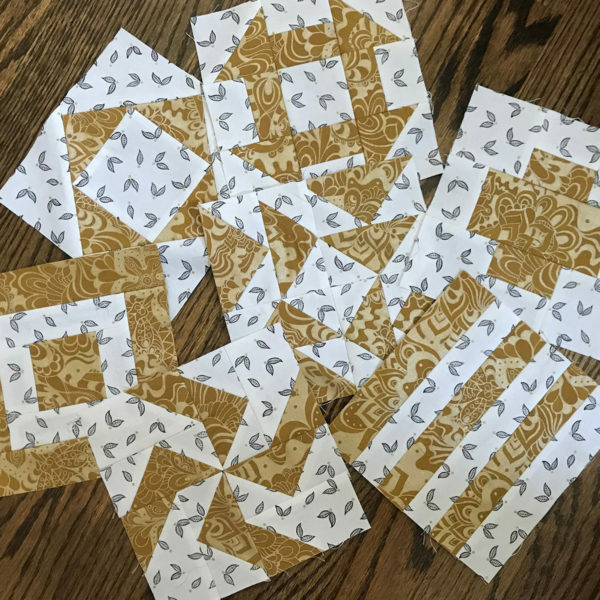 Show us your fabrics and/or your first blocks— we’d love to see! We have lots of great prizes in store—you can find contest rules here. 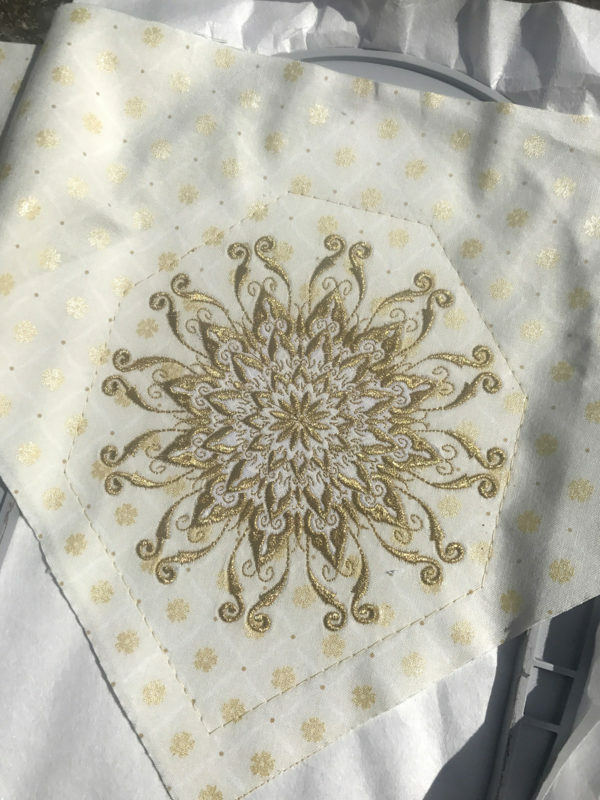 For optional embroidery, participants are eligible for a chance to win different prizes such as a set of Good Measure Quilting Rulers by Amanda Murphy, a bundle of Jubilee fabrics, and a digitized quilting collection by Amanda Murphy for OESD! That is it! I’ll be back in on November 7th to get you started on the next part of the Quilt-along and later in the month to do some more embroidery. I hope to sneak in some Quilts Market peeks—I have lots to sew before then! Happy quilting and HAPPY ANNIVERSARY, BERNINA! Thanks for the suggestion and so sorry that happened to you! It is so frustrating when one has embroidery problems! I hope you are through that end of it and can enjoy moving on with the project! Where is a link for the Quilt Along weeks 1 and 2? I have requested that information from Benartex but they are dependent on the English distributor to get that information. Hopefully they will be forthcoming, but it can be hard to get that information in the UK unfortunately. I notice you do not backstitch or tie off threads. I am worried they will be less secure and come apart. Advice? I don’t usually backstitch or tie off threads when piecing. They will be locked in the seams so I’ve never had a problem. The one time I might backstitch is when applying the final border pieces, which won’t be secured by subsequent seams. Okay, I`m confused. I stitched out the first triangle block. Now the book said there should be 41/2 inches from the center to side of triangle. On here you said to change that to 3 1/2. My finished design came as 4 1/2 in from the center of the design to the side of the triangle. Is this right or wrong? The file itself is right, so if you lined up the edge of the triangle on the initial placement line as pictured in the second to last picture on this post you should be good. The file stitches the center of the motif 3-1/2” (rather than 4-1/2”) from the placement line. That is why there is a correction from 4-1/2” to 3-1/2” for the measurement as listed in the booklet. I’ll be doing a video on this for next month showing the whole process. If you are using the file with the placement lines you actually don’t have to even mark the center of the motif. You can just place the triangle edges on the placement lines. The only reason you really would need the center marks are if you are replacing the motif with another embroidery design of your choice. Does this make sense? I am teaching tomorrow but will check back tomorrow night. Will you be leaving the videos and info on this site for quite awhile? I still have not received my fabric kit from my dealer and Christmas is coming so I can not start until late Jan.
Everything will be up in perpetuity so no worries! I just received my fabric kit so will try to catch up. One question before I start cutting — is the final block size 6″ or 6 1/2″? It would be so helpful if the length of each side was included. Thanks so much for a great project!!! The final block size is 6-1/2”, although once pieced into the quilt they finish at 6” if that makes sense. If you are cutting from the printed booklet make sure you have the corrections. You can find them at https://www.amandamurphydesign.com/Jubilee125_CORRECTIONS.pdf. Thank you — I just needed to make sure before I started cutting! !